The user is placed in a 360-degree scene in the Western Addition neighborhood of San Francisco, where a young resident is in the middle of a police encounter. 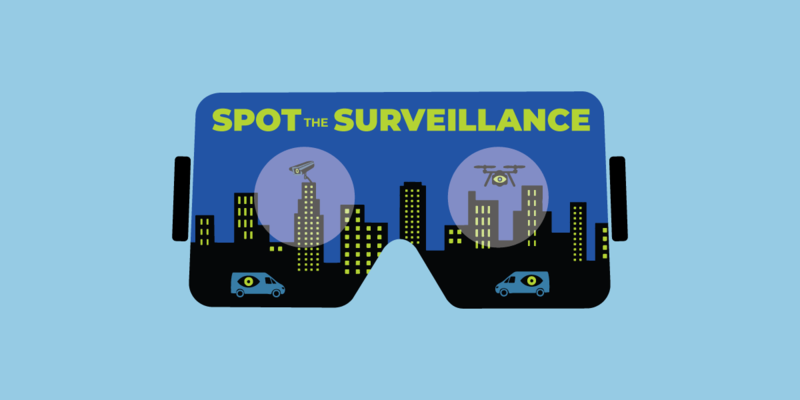 By looking up, down, and all around, you must identify a variety of surveillance technologies in the environment, including a body-worn camera, automated license plate readers, a drone, a mobile biometric device, and pan-tilt-zoom cameras. Spot the Surveillance currently works best with a virtual reality headset and a browser that is capable of displaying WebVR. A less-immersive version will work on standard computer browsers through a click-and-drag interface. Spot the Surveillance takes approximately 10 minutes to complete. Spot the Surveillance uses a gaze-based interface. This means that once you launch the experience, you will not require a handheld selection device. Instead, you will turn your head to position the central cursor—it looks like a white circle—to find items in the game, press buttons and close windows. To view Spot the Surveillance in a VR headset, you will need a VR-enabled browser. Once you have loaded the browser, please visit the URL https://eff.org/spot-vr. You will then see a start menu. Use your cursor to launch the VR experience by selecting the headset icon at the bottom right of the window. Spot the Surveillance functions with current Oculus devices using the standard Oculus browser. Spot the Surveillance requires a browser such as Firefox or Chromium. For instructions please see the WebVR page. Spot the Surveillance functions with current Mixed-Reality Headset devices using the Mixed-Reality browser. With the phone inserted in a cardboard headset, click the VR icon in the bottom right-hand corner of the screen to enter 3D mode. iOS: Apple devices will not allow browsers to expand completely, so there will be some browser text around the scene. iOS devices do not include audio. A monoscopic, mouse-controlled version is available from any current browser window. Use your mouse to move the central round cursor. EFF is seeking feedback on user experience at this stage of the production. We intend to incorporate the feedback and bug reports into a new version available online in approximately April 2019. We would be very grateful if you could take a few minutes to complete a survey once you have experienced Spot the Surveillance. The project is informed by years of research compiled by EFF through its Street-Level Surveillance project, which aims to shine a light on how police use (and abuse) technology to spy on communities. EFF’s engineering and design team combined the open-source coding language A-Frame with 360-degree photography to create this project, which is shareable under the Creative Commons Attribution license. The project was supported during its development through the XRstudio residency program at Mozilla. This project was also made possible with the support of a 2018 Journalism 360 Challenge grant. Journalism 360 is a global network of storytellers accelerating the understanding and production of immersive journalism. Its founding partners are the John S. and James L. Knight Foundation, Google New Initiative, and the Online News Association. The fixed ALPR, mobile ALPR, and drone images that appear in the pop-up displays were created by Mike Katz-Lacabe. They are licensed under the Creative Commons Attribution 4.0 International license. The images of mobile biometric devices were created by the U.S. Department of Homeland Security. A body-worn camera image was created by the Houston Police Department. An image of a rear-mounted ALPR camera was created by the Hingham Police Department.